Click the arrows on the left and right to see the whole process start to finish. I recommend enlarging your screen to the maximum. The silver becomes molten and forms a puddle in the bottom of the crucible. Warming up the mold is a good idea right before the pour is made. The flame must be kept on the molten silver while you pour. 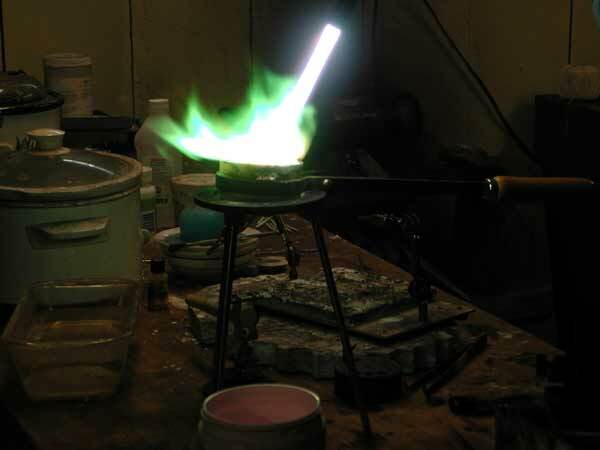 The molten metal must be poured into the ingot mold and allowed to cool. The resulting ingot can be forged into shape with a hammer, or forged down to size so it will fit into the draw plate. If smaller wire is desired, the ingot can be pulled through a drawplate until the intended size is reached. If wire is not desired, and the purpose of the ingot is to create an intricate forging, this is what it looks like begining and midway. This can be the elegant finish to an ancient process.